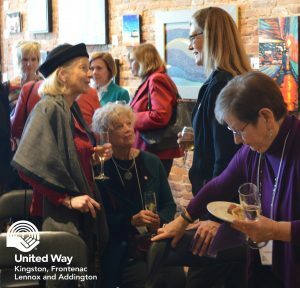 Women helping local women – that was the theme of the United Way KFL&A’s first Women United reception of the year on April 4. 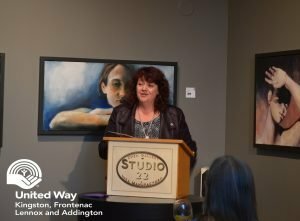 The event was held at Studio 22 Gallery and invited women in the community who are Leaders of the Way to attend, learn more about the issues facing women locally and have conversations on how to prevent those issues. 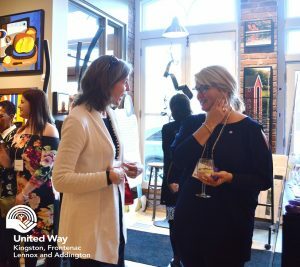 The goal of Women United is to bring women and resources together under the United Way umbrella in order to change lives and have a lasting positive impact on the local community. This message resonated with committee member Jane Lapointe who graciously sponsored the event. 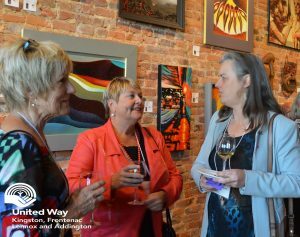 The Women United initiative is new to Kingston and area, but President and CEO of United Way KFL&A, Bhavana Varma, was quick to point out that women giving back certainly isn’t new. 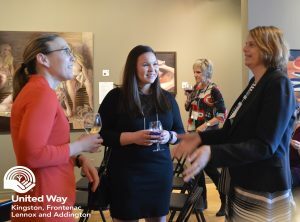 The reception brought more than 50 women together for an evening of networking, conversation, wine, hors d’oeuvres and messages from women in the community. 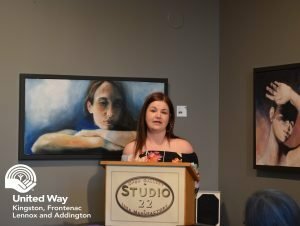 Alexis Babcock, began the formal portion of the evening by sharing her story, detailing her experiences with drug addiction, mental health, human trafficking and more. Luckily, she found support through the Youth Diversion program and other agencies, but her story brought tears to the eyes of many in the room. 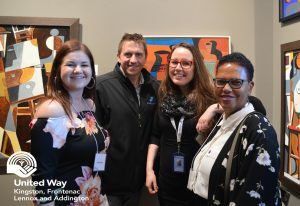 In addition to Alexis’s story, those in attendance heard from Jaymi Hayward, a counsellor with the Kairos program at Youth Diversion, Lindsey Belch, Executive Director of Girls Inc. and Antje McNeely, Chief of Police, Kingston Police and co-chair of Women United. All were happy to share their perspectives on issues facing women and girls in the community. For her part, Lindsay Belch shared some of the great work that Girls Inc. has been doing in the community and helping girls find confidence, learn life skills and succeed. Lindsay Belch talking about Girls Inc. 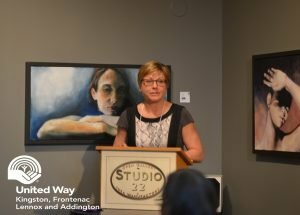 This call to action resonated with many in the room and especially Kingston’s new and first female Police Chief Antje McNeely. For her part, Chief McNeely spoke of the struggles women face in workplaces and the obstacles that she herself had to overcome. She concluded by offering ways that women can help each other. 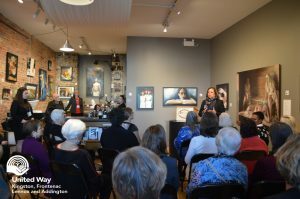 In the end, the goal of the reception was to inspire conversation and create a broader sense of awareness of the issues facing the KFL&A community and more specifically women within it. Varma encouraged feedback on any and all of the topics going forward.